We've designed these aluminium greenhouse staging foot plates to prevent the legs of our greenhouse staging units and seed tray racks from sinking into the ground in greenhouses with a soft floor, or for when the units are located on gravel, shingle or any uneven surface. 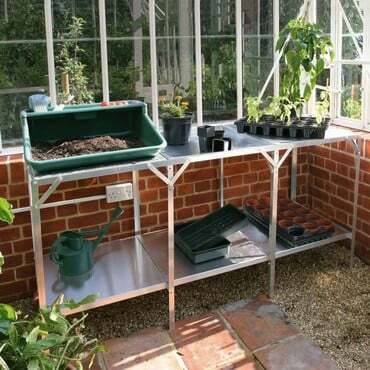 The aluminium greenhouse staging foot plates measure 95mm x 75mm and have a clever 28mm aluminium 'upstand' to help prevent the legs of the greenhouse staging units sliding off. 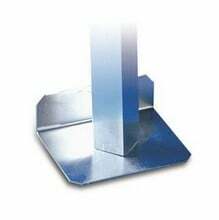 One of those small but very handy greenhouse essentials, the aluminium greenhouse staging foot plates are worth their weight in gold when you consider how disastrous a fully laden greenhouse staging unit - available in single tier, two tier and three tier models - listing to one side could be! Much easier to use than the slabs when the staging needs moving around. Would be better if they had sides and front as well because they do sometimes slip off but for the price I'm pleased I bought them. seem flimsy for the job - arrived bent as such thin aluminium, but do the job none the less.